Here, at long last, is the story of my tattoo. If you read this post, you know that this is something I have been thinking about for a long time. 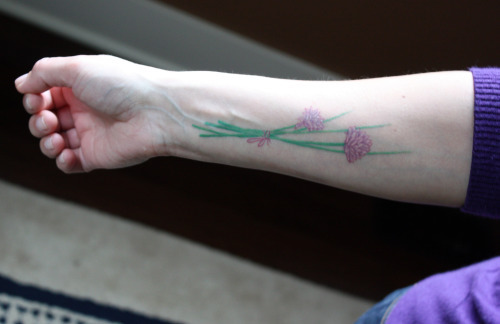 Once I finally decided on what I wanted (chive blossoms) and where (forearm), I had to find an artist. Some close friends with multiple tattoos highly recommended their artist so I decided to go with him. I met with him to discuss my vision and then made an appointment to get the work done. I was excited and felt really good about my decision. As the day of the appointment got closer, I started to feel uneasy. I still wanted the tattoo but started to think smaller would be better. Maybe not my forearm, maybe my wrist instead. Maybe just one blossom instead of multiple. I sent a panicked email to the artist asking if we could go smaller and he responded that no, we couldn’t because the lines of the stalks are so small and delicate that shrinking them would make it impossible to do in this medium (i.e. needles on skin). “Be brave.” That was the last line of his email. I wasn’t. A tattoo is forever and you can’t feel unsure. I canceled the appointment. Almost immediately after canceling, I realized how much I wanted it. For me, it was like trying on a dress that I wasn’t sure about. In my shopping life, if I’m not 100% convinced I love something, I walk away from it. If two hours go by and I don’t think of that dress once, I know I don’t really want it. If I spend two hours scheming about how to get back to that store – even if I have to drag my boys with me – I know I have to go buy it. With my tattoo, those two hours became a few weeks so by the time we went on vacation, I was positive I wanted to get it. To some, it might seem impulsive that I walked into a tattoo parlor in Provincetown and ended up getting a tattoo later that same day, but it really wasn’t. This decision was months in the making and I was just ready. Yes, it may have been smarter to find a local artist or go back with the original guy but smarter isn’t always better. Randy, the boys and I all walked in to a place slightly off the beaten track and got a decidedly cool look from the guy behind the counter. Not rude but definitely “what is this soccer mom doing in my place of business?”. (For the record, I am not a soccer mom – not that there is anything wrong with soccer moms.) I asked him if he knew what a chive blossom looked like. His cool look warmed slightly. Yes, he knew what they looked like and he loved the green and purple. He pulled up some photos online and we found a few that looked right. He highly recommended a guest artist they had in town, a guy named DC, saying all the guys in the parlor were going to get work done by him that evening. DC was the prototypical tattoo artist. Bandana on his head, long beard, leather vest, tattoos covering his arms. He too liked the idea of the chives. We looked at the pictures, talked a bit, and then he asked me to wait a few minutes while he drew something up. I said nothing to him about how many blossoms I wanted and I also said nothing about thinking maybe there should be a bit of string tying them together. A few minutes later, he came out with a drawing feature two blossoms (I had two in mind to symbolize my boys) and with a dainty string tying the stems together. I knew for sure that I had found the right guy. Any lingering doubts I had disappeared. Here are answers to the questions I keep getting. I don’t have a good answer for that one. I just had a vision of it being there. Originally I was going to go with my left arm and then, for no explainable reason, I changed to the right. I have a very small Leo sign on my back which, unless I am looking in a mirror, I never see. I like that it is there but I forget about it half the time. And living in the climate we do, really the only time it is visible is in a yoga class. I guess I wanted something I could show, and see, any time. Oh my god, yes. I wasn’t all that nervous about the pain because, after all, I have been through labor and 2 c-sections. I know pain. But I wasn’t prepared for how much it would hurt. He started at the wrist end which is much more painful and there were moments where I honestly didn’t think I could stand it. The only thing that kept me from stopping him is I knew I couldn’t have some random half-finished lines on my arm for the rest of my life. As time went on (it took a little over an hour), the pain got more tolerable. It was sore for a few days and then itchy. Now it is almost healed and like labor, I know I will soon forget about the pain. 4) What does your husband think? Randy has been supportive about and slightly baffled by this whole thing. He is the one who came up with the idea of an herb and I think he liked the idea of it all along. When we started specifically talking about chives being on my forearm until death do us part, he got a little skittish. But never once did he suggest that I not do it. Now I think he really likes it. It is pretty, delicate, and it symbolizes such an important part of me. 5) Do you love it? I know the photos make it look disembodied but I tried several different ways of taking pictures and they all looked kind of weird. I hope you get a feel for it. 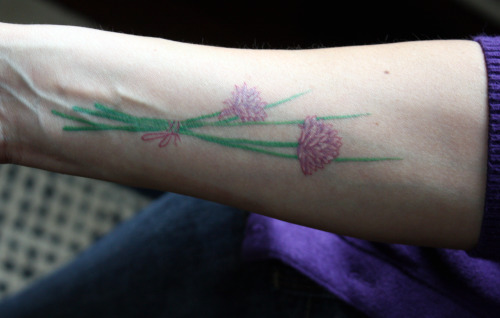 That is one of the most delicate, prettiest tattoos I’ve ever seen—very feminine. Good for you, and here’s wishing you a happy birthday as well. You’re off soon, yes? We’re going to have to celebrate when you get back! Oh my…what a beautiful, beautiful tattoo and a fabulous story behind it. In my experience, you begin to love the tattoo once a whole heap of time passes and you get to remember the time in which you got it. For example, I have a silly butterfly on my shoulder that I got the second I turned 18. It’s not a great tattoo and now it’s definitely faded, but I love it b/c it reminds me of being a kid and feeling that sense of freedom and spontaneity that you can never really duplicate as an adult. So I think you’ll love it eventually. Though you know how I feel about tattoos, it came out very pretty, and I am glad you got it, because you wanted it so badly! I just showed it to Henry and he said “wow, chives”. Enjoy your new addition……..you have a box on the way (no chives or tattoos inside). the ribbon really brings it all together-smart very smart to add that in. yeah i bet it was painful down by the wrist. Wow! That is absolutely gorgeous! I love plant/food themed tattoos. So excited to discover your blog- you are a fantastic writer. It’s so dainty and sweet! I’m so glad you go it! The 2 blossoms symbolizing your boys is so beautiful. For how long after was your arm sore/hurting? I think that you definitely made the right decision. It looks very pretty. Chives were a good choice and I like how they symbolize not only the part of you that likes to cook, but the fact that you are a wonderful mother. I can’t wait to see it in person!!! I remember during our lunch you were tossing around the idea. So happy to see it materialize. I think it’s lovely and it’s you! You’re no soccer mom, Dana! (Again, nothing wrong with them!) I play soccer and I’m nearly a mom, does that make me one? I love chive blossoms! !This is a lovely delicate tattoo. I admire you for going for it, just reading your post made me queasy, I am a wimp for pain. I LOVE it Dana. Congrats! It turned out beautifully! I am not a huge fan of tattoos, there are very few and far between that I think look great . For THIS one ,however, I make an exception – because it is really beautiful , the clincher for me is the bow – most unexpected and is what makes it ever so classy. Safe travels and Happy Birthday … soon . It’s beautiful. Symbolic, I think, for you as a cook and mom. As one who has tattoos on both forearms, I understand your hesitation about having them so visible forever; but I think the way you found your artist, and in his finding exactly what you were looking for, was fated. Very exciting! p.s. I just found your website recently, and love it (and the fact that you are also in Seattle) Keep up the great work! I really love it! It’s so sweet and personal, it’s unique to you and I love that you just went for it. I love the color and how it’s a little unexpected in the realm of the tattoo world. love it!!!! so you, I am jealous of your bravery. enjoy your trip and happy birthday!! Tattoo & you are fabulous, lady. Great story – sounds like the universe made it happen just the way it should :) Can’t wait to see you (and it) in person! Glad u are happy with your new tattoo! Love, love, love the tattoo. It’s beautiful, and very original, which is rare. I think you’ll come to love it. It’s beautiful. :) And how perfect that the tattoo artist designed it just as you wanted it without even having a discussion. I have a similar story — I knew for almost 10 years what I wanted and where but kept waiting. And waiting. And then last June I was in San Francisco, walked into a tattoo parlor and got it done. Bam! My friends thought it was crazy and impulsive but really it was the opposite. And yes, at first, I second guessed the placement and angle but now — a year later — I love it and wouldn’t have it removed for all the french fries in the world. Thanks for this post. I read it back in June when you wrote it, but I was in need of some reassurance: I’m scheduled to start getting a half-sleeve this Friday. Same concept of flowers (in my case, hydrangeas), same level of insecurity, same fears (“What if I don’t like it?” “What if it fades?”), but also the same philosophy: sometimes things are best thought through, other things are best done on a whim. Obviously a half-sleeve is a bigger commitment than something, um, not so big, but I do believe that tattoos are a physical snapshot of where one is at in their life. Whether it commemorates (not-so-) true love, a trip with friends, or a belief held at the time, it’s just a notch on the belt, you know? But I digress…thanks again for putting my mind a little more at ease. C’est la vie :).